This is Quick Take #88 make a wish!! This means the Friday the 13th “bad luck” cancels out…right? I never believed in that kind of thing anyway. Do you use swagbucks? This week there are TONS of codes for extra swagbucks. Check out my post from last week to get all the codes. There was a code earlier this morning (6-8AM PDT) but there will be several more next week. Man school is kicking my but this week! So MUCH work! I really hate taking online classes but several classes I needed weren’t available any other way unless I wanted to drive an hour each way (twice a week) which I didn’t have the gas money for and that would have gotten old fast. Oh well I’ll make it..somehow..for now Starbucks is my BFF. I’m not much for celebrity gossip or news but I read this awesome article about Melissa Joan Hart and how she doesn’t even care if she never loses her “baby weight.” She even said she’d have more kids and NOT because she wants a girl which I really liked esp in this world where society says you need to have 1.2 kids. You can read it here. P.S. I LOVE following her on twitter and instagram she’s so down to earth and posts things that normal people would post. The Five Minute Friday posts have been going up earlier. I posted mine last night. You can read it here. This weeks word was MERCY and I talked about a lot of Catholic Rituals. It’s weird as hard as I try to stay neutral sometimes my catholic roots always come out. It was really cool because I tweeted about the “Lord have Mercy” responses in mass in the twitter party #FMFParty and a TON of people tweeted back, “OMG you’re Catholic? Awesome! ME TOO! !” Or things like, “Now I am singing that song in my head.” I love twitter. I meet so many awesome people on there. Last Fall I started going to a new Young Adult Group at a parish about 45 minutes away. I went to just about every event until February. I stopped hearing from them and didn’t know if they took me off their mailing list or the group fell apart. Well I got an email last week from the new youth minister at the parish that he is working on rebuilding the group and working on a schedule. Super psyched about this as I really enjoyed the group and the group is the closest young adult group to my house. So yay for potential new friends/things for me to do. 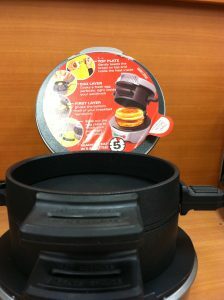 Last weekend we went and registered my sister at Target and I saw this awesome GADGET that I MUST HAVE!! Make your own Egg mcmuffins at home EASILY. I tried to make some last year in a muffin pan and FAILED miserably….this is the answer to my problems!! Apparently facebook doesn’t show me the swagbucks updates in my newsfeed anymore and I’ve been missing all of them :(. Sad times!!! Hate that!! They actually did this last month and I missed it. I got an email about this round…I’ve already missed one day..oh well there are 3 more left! I did the swagbucks thing for a while and then realized it didn’t pay very well per hour and I had other things to do. My husband and I met through Catholic singles groups, as did our young adult group of friends. I saw a couple of groups go through a cycle of getting popular, having the involved folks who had any social skills pair up and then the group slowly dying as the folks who were left could not attract or keep new members. Yeah I get the most use out of swagbucks by watching videos on my app when I remember to turn them on. Most of the young adult groups I’ve been involved in have had that cycle. A lot of it is because of how mobile we are..constantly moving. This guy sounds optimistic so I’m willing to see how it goes. Melissa Joan Hart does seem so down to earth! I really like her, too! She does! I’ve always liked her ever since I was younger and watched Clarissa Explains It All. Gadgets are EVIL!!!!! 🙂 I’m glad that you heard from that YM, and hopefully things will be back in business with the group. Fall seems to bring everyone back together; it’s like we’re all kids on summer break still. I know it’s like no matter how old we get we’re in the dreaded Fall – Spring cycle of life. Thank you for the Swag Codes. I’m new to SwagBucks so I’m still learning all the different ways to earn points. I never liked Egg McMuffins as a kid, but now I would love to make them at home. The best way I have earned Swagbucks is through the video app on my phone. I let the videos run while I am at my computer or sleeping and earn points. Yeah I was never into Egg McMuffins I liked the bagel ones but I think making them at home would be way more fun!